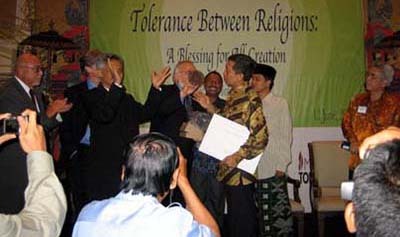 Bali, Indonesia — On June 12, 2007, LibForAll Foundation—together with the Wahid Institute and the Simon Wiesenthal Center’s Museum of Tolerance—hosted an historic religious summit in Indonesia, which has not only the world’s largest Muslim population, but also a venerable tradition of religious pluralism and tolerance that is under constant attack by religious extremists. 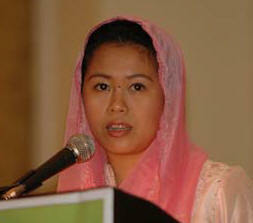 The summit opened with the recitation of Muslim, Hindu, Christian, Buddhist and Jewish scriptures. 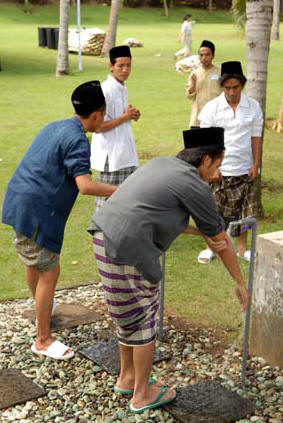 Here, an Islamic boarding school student from Central Java reads from the 21st chapter of the Qur’an, whose verse—“I (Allah) created you (Muhammad) to be nothing but a blessing for all creation”—serves as one of LibForAll’s guiding principles, which unites those who are committed to a pluralistic and tolerant understanding of Islam, at peace with itself and the modern world. 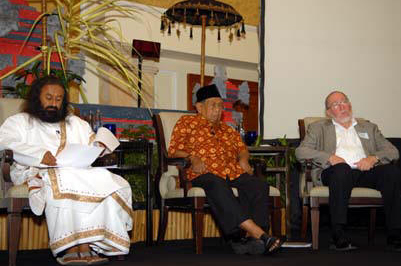 In the opening session, three religious leaders engaged in a roundtable discussion of the plenary topic: President Wahid (center), a renowned Islamic theologian who for 15 years headed the world’s largest Muslim organization, the Nahdlatul Ulama; His Holiness Sri Sri Ravi Shankar (left), a revered Hindu leader with a global following; and Rabbi Daniel Landes (right) — Director of the Pardes Institute of Jewish Studies in Jerusalem, and scion of a long line of rabbis including the former Chief Rabbi of Jerusalem. 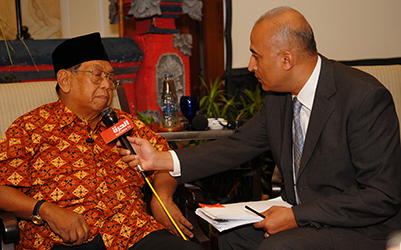 President Wahid (left, being interviewed in Arabic for broadcast in the Middle East) and other Muslim speakers at the summit had previously declined invitations to attend the December 2006 Holocaust Denial conference held in Tehran, Iran. 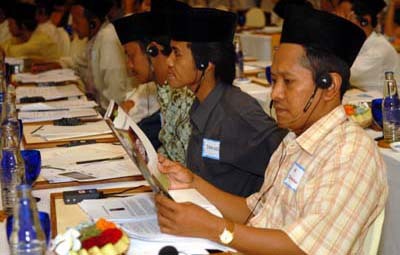 Simultaneous translation facilities enabled attendees to understand both English and Indonesian speakers. In addition to internationally-acclaimed religious leaders, attendees included Hindu and Christian students from eight Balinese universities and high schools, and representatives of fourteen Islamic boarding schools in Central Java. The morning plenary’s second panel included Dr. Yoichi Kawada (left), Vice President of Soka Gokkai, a Japanese Buddhist organization whose leaders were imprisoned, tortured and executed during WWII for refusing to cooperate with their government’s wartime policy. Panel members also included Father Franz Magnis-Suseno, S.J. 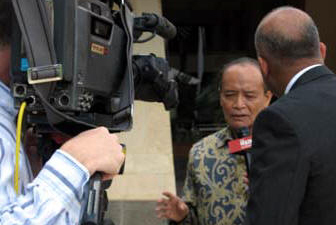 (center), who witnessed the Holocaust as a child living in Eastern Germany, and Reverend Tjahjadi Nugroho (right), Director of the Indonesian Pastors Association. Each of the speakers provided compelling personal testimony, and called upon their fellow religious leaders to take a principled stand against the ideologies of hatred and violence, whatever their source. Rest breaks were scheduled to coincide with the normal times for Muslim prayer. 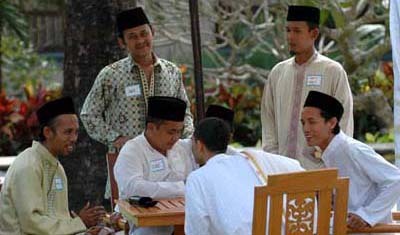 Young Muslim leaders from Central Java washing in preparation for noon prayer (right) and engaged in animated discussion with an Indian monk who serves as assistant to Hindu religious leader Sri Sri Ravi Shankar (above). 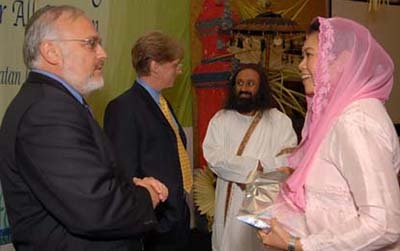 Rabbi Abraham Cooper of the Simon Wiesenthal Center chats with Yenny Wahid, while LibForAll CEO C. Holland Taylor reviews the morning session with Sri Sri Ravi Shankar. A dynamic press conference attended by the world’s leading news services opened with President Wahid’s and Rabbi Israel Lau’s joint denunciation of Holocaust denial, which appeared in the Wall Street Journal. Press Conference speakers included, from left to right, LibForAll CEO Holland Taylor; President Wahid; Indonesian Pastors’ Association head Rev. 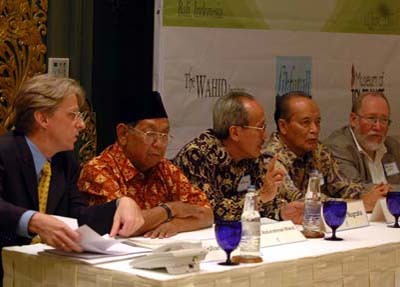 Tjahjadi Nugraha; Dr. Syafii Maarif, former Chairman of the world’s second-largest Muslim organization, the Muhammadiyah; and Rabbi Daniel Landes of the Pardees Institute of Jewish Studies in Jerusalem, in addition to other Muslim, Hindu, Buddhist and Christian leaders not shown here. LibForAll Programs Director Hodri Ariev reading the Summit’s Joint Declaration (see Final Conference Communiqué, below) in Indonesian, flanked by Rabbi Abraham Cooper. 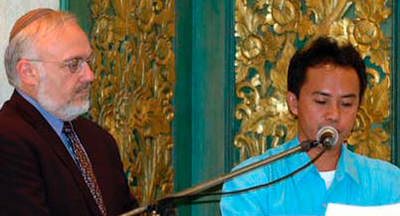 An afternoon “Victims of Terrorism” panel included two Hindu victims of the first Bali bombing in October of 2002, and Febby (right), a Muslim who suffered burns to over 90% of his body in the Jakarta Marriott bombing in 2004, which occurred just ten days before his scheduled wedding. 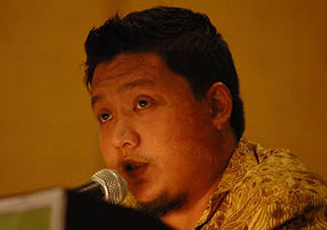 Febby and his fiancé were married some two months later, in a Jakarta Hospital’s Burn Unit. 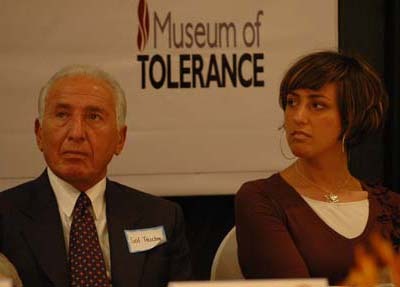 Holocaust survivor Sol Teichman (left, with suicide bombing victim Tzippy Cohen) described how he lost 70 members of his family to the Holocaust. “I ask only one question,” said Teichman, who was sent to Auschwitz, Dachau, and three other concentration camps before allied forces liberated him in 1945. Those of all faiths—Muslims, Hindus, Christians, Jews and Buddhists—were moved to tears, as victims of terror described their personal suffering and loss of family members at the hands of fanatics, driven by the ideology of hatred. 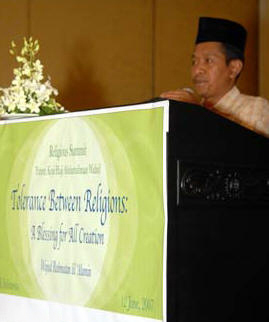 Dr. Syafii Maarif, former chairman of the Muhammadiyah—the world’s second-largest Muslim organization, with 30 million members—helped moderate an afternoon session on Best Practices of Tolerance, which rocked the audience with impassioned calls for a pluralistic and tolerant understanding of Islam. 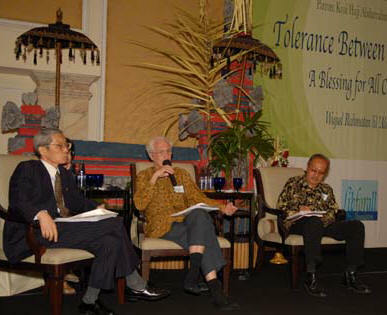 Speakers included Dr. Abdul Munir Mulkhan of the Muhammadiyah, who is a member of Indonesia’s Human Rights Commission; Kyai Haji Yusuf Chudlori, a leading cleric from the 50-million-strong Nahdlatul Ulama; and Haji Bambang (right), a Muslim who lives near the site of the first Bali bombing, and who helped lead the evacuation of victims from the blazing inferno on the night of that attack. 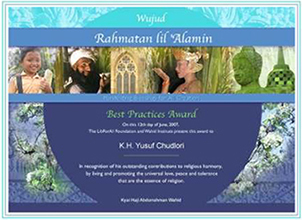 Each of the “Best Practices of Tolerance” speakers received LibForAll’s Wujud Rahmatan lil ‘Alamin (“Manifesting Religion as a Blessing for All Creation”) Award, in recognition of their upholding the highest principles of religion, and inspiring others to follow their example. 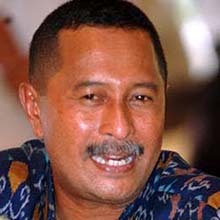 LibForAll Foundation, the Wahid Institute and the Simon Wiesenthal Center’s Museum of Tolerance also gave General I Mangku Pastika (center, wearing yellow batik shirt) a joint Community Service Award for the successful identification, capture and sentencing of over 30 terrorists responsible for the first Bali bombing, which killed 202 people. 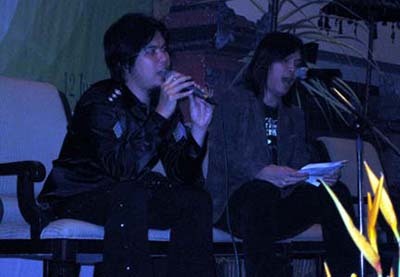 LibForAll activists Ahmad Dhani and Once of the legendary rock group Dewa closed the event with a performance of their #1 hits Satu (“Oneness”) and Laskar Cinta (“Warriors of Love”), the latter publicly performed in English for the first time. Embodying the vision of religion as “a blessing for all creation,” the songs call upon youth to respect religious differences, and devote themselves to the path of spiritual love, rather than hatred and violence. Religion, the art of peace, speaks to the peoples of the world of compassion, justice and mutual understanding. A blessing for all creation, religion is a constant reminder to humanity of the divine spark in every person. Yet today the world shudders as horrific acts are perpetrated in the name of religion. All too often, hatred and violence replace peace as religion is manipulated for political purposes. Leaders of the world’s religions have a special obligation to refute such claims, and to mobilize their communities to not only respect, but also defend the rights of others to live and worship differently. 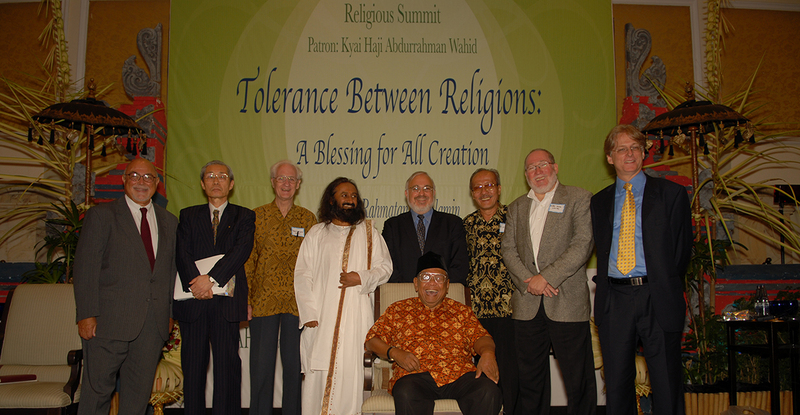 We, the undersigned, gathered here today in Bali, Indonesia, take a stand against wanton violence, and urge other religious leaders to follow our example in respect to our diversity and our commitment to end the violence.